Should I Care About Sponsored Post Contracts? Yes, and let me touch on just one reason why. The landscape of advertising has changed drastically in the last decade. Even within the past couple of years we’ve seen dramatic changes! Banner ads used to be “the thing” bloggers HAD to have above the fold. Sidebars were stocked with cookie-based ads with CPM backfills and a slew of other acronym-based ad options. But times have changed. An entire generation has basically tuned out the sidebar and ad blockers are coming as a standard feature on hardware. 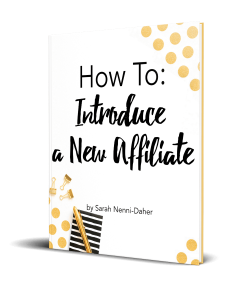 This has led to more influence-based advertising, and that’s where you come in. Studies have shown influencer marketing can have an 11 x ROI over a banner ad and millions of impressions months after the campaign ends! I am not an attorney and this post does not constitute legal advice. That being said, brands have legal teams and most bloggers do not. If you’re going to work with brands, you need to know a bit about sponsored post contracts. What is the timing of the contract? What do the general conditions state – not just those pertaining to the work? I can’t urge you enough to read these. The terms could include post, shares, and reporting dates as well as link requirement dates. It could state that the date you emailed for payment is being pushed out to the ‘nearest payment session’ at the end of the quarter. It could state that you’re contracted as a ‘work made for hire’ partner (more later). 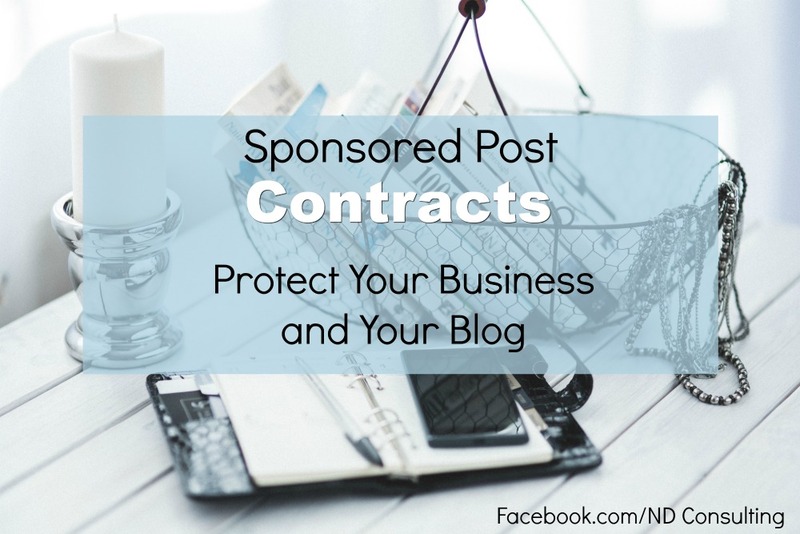 There are so many things to look out for in this section in your sponsored post contracts, and the only way you’ll know is if you actually read it. Most companies will be willing to work with you but some have standard language they will not remove. You must know the terms before you can make an informed decision for your business. What are you being paid for and when will you be paid? Make sure you know all the payment terms and what needs to be done by when. Get all deliverables in writing (number of posts, due dates, reporting, social shares, videos, etc.). if you reach out to the company on social media (for late payment, for example), you could be in violation of terms. The point: know what you need to do (including post-reporting), as well as how and when you’ll be paid. Warning bells go off for me when I see language of any kind surrounding my business’ future working relationships. That’s not to say don’t take those contracts, but I’m mentioning it here to remind you to get the terms as specific as you want them to be. Not being specific can get you into a world of hurt later, so it’s best to narrow things down. An example: a paper towel company wants to hire you and included in your contract is, “Influencer cannot work with any other paper supply company for 1 year from publication date.” That would be a big red flag for me! What do they define as a ‘paper supply’ company? Toilet paper, paper towels, party napkins, gift bags, scrapbooking supplies… One could be severely limited by these terms if signed as-is or be in violation and not know it. This is an example of something I would want to be clarified and amended before signing. They would pay me a healthy amount, however, I would have to sign over the images and any content used within the spread to them. As you can imagine, this poses a significant problem because it was a popular piece for my site. I declined because they wouldn’t change these terms. Even when agreeing to online features, please make sure you ask about this! Your content is yours unless you sign it away. Claiming, “I didn’t read the contract” doesn’t hold up. Another thing to be on the look-out for is a “work for hire” or “work made for hire.” These basically mean you don’t own the content and you are releasing the ownership of the property. Weigh your options: the pay might be more but YOU become the restricted party. Here is additional reading on Work for Hire. I personally know many bloggers who have broken terms, and this is one of the biggest culprits. 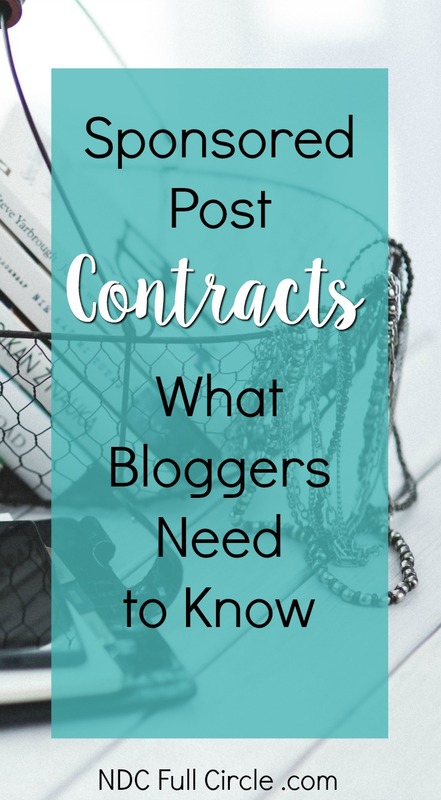 If you are telling another blogger how much you received for a certain amount of work and your contract states you cannot disclose that, you are breaking terms. If you cite a non-payment issue via a social media platform, you could be in violation of your agreement. Always work within the company’s structure and know the terms. No one wants a legal battle. Those of us who have been working directly with brands awhile know that there are a few things we will not allow to be excluded from contracts. Here are a few of the most popular. It makes perfect sense that if someone doesn’t pay their invoice or fulfill the terms of the contract, late fees will be assessed. If you don’t pay your mortgage on time, you are billed a late fee, right? Brands should be held to the same standards and it is wise to include these terms in a contract. Most of mine are amended to state that if the brand fails to pay the invoice by x date (or clearly-defined time period), a late fee of x dollars will be added every x days. And I hold them to it by sending invoices (and a link to the contract, of course)! What happens if the post is due and you still don’t have the product? What happens if the product was delayed and you were advised to “go buy it and we’ll reimburse you?” What happens if you get the product and absolutely hate it? Newer influencers might shy away from these discussions, but I urge you to consider putting them into a contract. Lately, I’ve seen a trend of brands adding in that they own all content, images (even the image of your face used on your blog) and that they can be used in perpetuity in any way they see fit. If you’re fine with that, be sure to charge accordingly. If you’re not fine with those terms, call them out and negotiate. 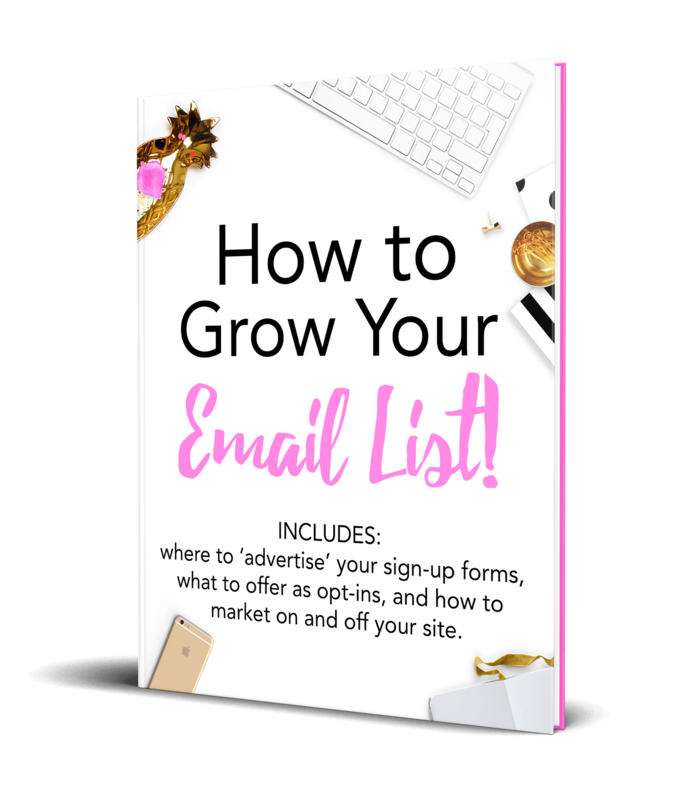 There have also been requests by brands – after the content has been written and ranked – to have bloggers use a canonical link to the brand’s duplicate content. 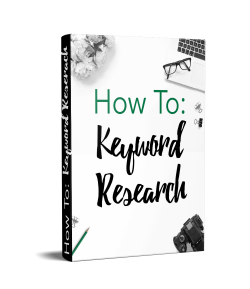 This would allow ALL the SEO juice of the blogger’s work to go to the brand. Be aware and be a smart business owner. Make sure ownership (and what it looks like) is clearly defined. Note: read below for photography-specific ownership and usage. In poorly story-boarded or loosely-defined content parameters, it’s not uncommon for brands to request an edit. And another edit. And oh, after so-and-so saw it, he wants it to say this. And this. And this. And yeah, we also want you to put the brand name in the URL and on all imagery. After it’s already been approved. Edits cost you time and reduce your pay if not clearly defined. You can state the number of allowed edits or the time period allowed for communicating edits. Just be sure to consider this. There should be clear requirements for deliverables and the number of edits YOU will allow. I’ve had it happen and so many other bloggers, too, where we storyboard the post and theme and have the client ask for a reshoot or additional images. Reshoots cost you money and time – lots of it. Be sure you have a contract note about reshoots and the pricing you will charge. One of the biggest questions I receive from clients is about licensing of the photos. If you don’t include licensing in your initial proposal (the price you charge for the work), licensing should be an added fee. If you do include it in your proposal, stick to your guns. Pricing can be for each image or the package, but do not let a brand bully you into believing they have free reign to use your images outside of the terms of the contract. As always, I’ll add to this post. 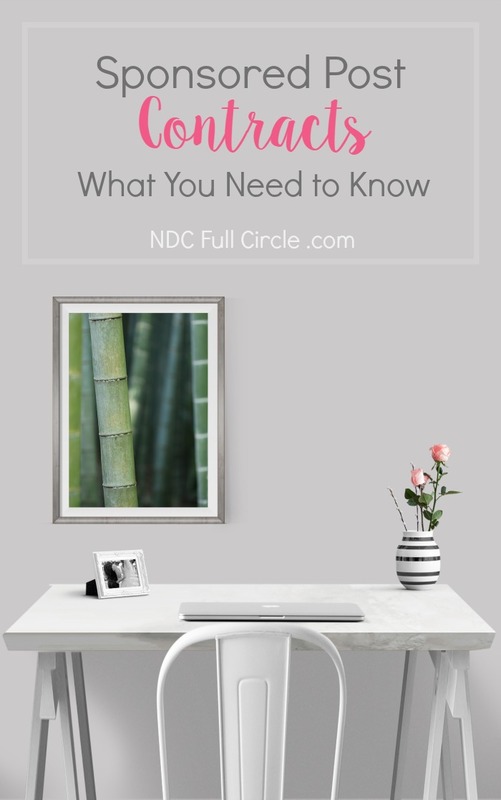 Be sure to sign up to the once-weekly NDC newsletter to stay in touch. Sponsored post contracts are diverse however, there are so many reasons to read through and understand them. Protecting your creative work and your reputation are key components of a successful business blogger.